The Volcom Skindawg Jacket doesn’t have it all but it has a lot for those that want something that stands out but doesn’t scream when you are riding on the warmer days. 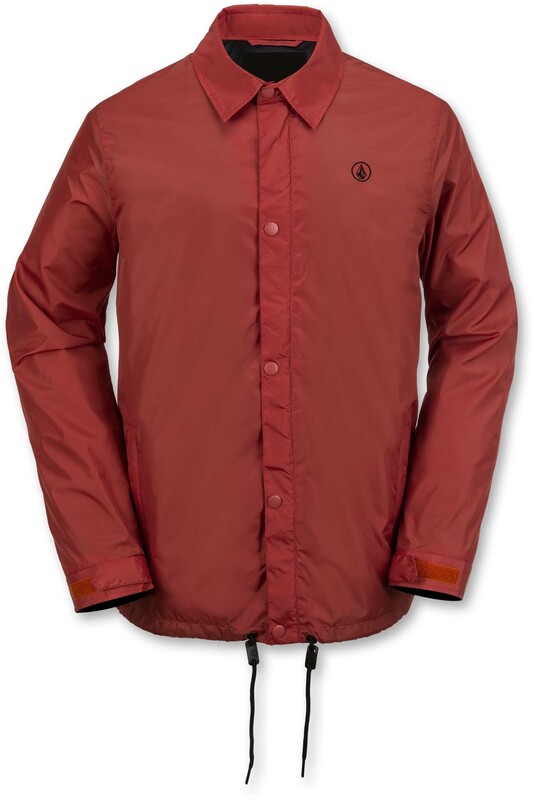 The Volcom Skindawg Jacket is a very minimalist warm weather shell that’s good in a quiver of jackets but not a good stand a lone. It’s got a good fit though and as you can see from the video it’s much more orange than the pic on Volcom’s site that leaves you to believe it’s more burnt orange bordering on burgundy. 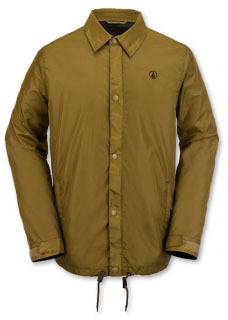 We try to get as many images of the Volcom Skindawg Jacket, but forgive us if they're not all there. 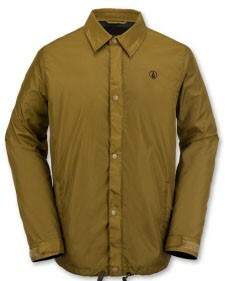 I wanted a warm weather jacket to wear at Bear Mt and it was down to the Volcom Skindawg and Analog Foxhole. I went with the Skindawg because of the Zip-Tech and adjustable wrist cuff. The pocket system on the Foxhole could be problematic during gnarly tumbles since stuff could potentially fall out. I ordered a size large from The-House. At 5’9, 185, and 43” chest I’m a little smaller than James, but the L seemed to fit him without being too big and I plan on wearing a hoodie underneath. Arms at my side the sleeves/body sit at my knuckles. For a casual jacket this would be a touch long, but for snowboarding its just right. The width of the jacket leaves enough room for layering with a sweatshirt. Mobility seems ok but it gets a little tight when bending over or crouching for an ollie (gets tight in waist area). Compared to other Volcom coaches jackets, the Skindawg does fit bigger. In a store I tried on M and L in their standard coaches jacket. The medium was tight in the chest and sat on my belt line. The large went down to my wrists and was a slim fit. The Skindawg is 2-3 inches longer in the body and a little longer in the arms. It also offers a looser fit. Volcom Zip-Tech is a cool feature, but it has limitations in regards to sizing. According to Volcoms size guide, I should be a small based on height alone. Since I bought a large, the Zip-Tech sits lower than it should on my body. When zipped into my pants the jacket gets pulled up just a little, nothing overly noticeable, but I can feel the Zip-Tech skirt is maxed out. I should also note I wear my pants a little higher, closer to my belly button, so if I sag them its fine. On the flip side, if you are really tall, and wear a smaller jacket, you could also experience issues. For the extra $20 you get some nice features that a normal coaches jacket doesn’t have. Zip front and zip pockets are worth it alone. If you like a lot of mobility with no restriction, you may want to look at a DWR sweatshirt. The cut and material of the Skindawg can be a bit confining, especially if it sits below the waist, but leaving the bottom unbuttoned helps. Overall it’s a good option and keeps you from bringing out your expensive cold weather jacket to get sweaty, muddy, or stolen after you leave it on a table because it was too hot.